If you would like to increase your business productivity but have no idea how to run dual monitors from a single computer and organize several workplaces, you’ve come to the right place. IBIK company is ready to offer you ASTER – the best dual monitor software solution designed to allow several users work with one computer simultaneously and independently as if each of them had their own PC. ASTER allows to run dual monitors through supporting several users within a single computer system. The best dual monitor software from IBIK company will show you how to run dual monitors without the necessity to buy additional hardware. Just equip your computer with another monitor, keyboard and an extra mouse and enjoy couple of full-featured workplaces with an excellent and stable operation. 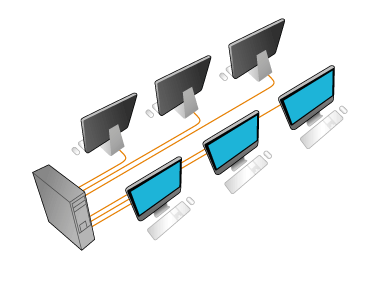 Essentially, using dual computer monitors can be useful for both personal usage and business organizations. By running dual computer monitors from one computer system with ASTER, you reduce costs of equipping workplaces for employees as well as ensure optimal productivity for your company. As the best dual monitor software solution from IBIK has several editions designed for a different number of workstations, it can be successfully used not only in offices but also in schools, universities and other government and commercial companies. Forget about thin clients and terminals by learning how to run dual monitors from a single computer! Be assured, ASTER is the best dual monitor software tool allowing you to create independent computerized workplaces without having to purchase a full set of computers.